Once again the impacts of free trade are at the forefront of international economic discussions. From renegotiating the North American Free Trade Agreement (NAFTA), to the Trans-Pacific Partnership, to Brexit, many nations are reanalyzing their views on international trade and globalization. This article examines the impacts of two major trade liberalization events on Texas manufacturing employment: the implementation of NAFTA and China's accession into the World Trade Organization (WTO). The general effects of globalization are well established. Trade barrier reductions typically benefit economies at the aggregate level but, in turn, redistribute economic activity. Distributional changes imply the transfer of resources from one group to another. For example, economic activity could shift between industries, geographic regions, or income strata. Practically speaking, liberalizing trade has a net benefit for each participant, but there are respective winners and losers within the groups. Within the United States, Texas benefits greatly from free trade because of its location on an international border and its access to maritime trade routes through the Gulf of Mexico. Texas became the national export leader in 2002 and currently accounts for more than 17 percent of total U.S. exports. Texas exports support over one million jobs, 95 percent of which are manufacturing related. However, globalization and resource reallocation also harmed many Texans. Since 1975, more than 278,000 Texas jobs have been lost as a direct result of international trade. Communities supported by labor-intensive industries, such as the border metropolitan areas, suffered disproportionately. The consequences of intense exposure to foreign competition not only reduced jobs but subdued wages and labor force participation while increasing income assistance transfer benefits (such as Social Security disability insurance and temporary assistance for needy families). The breadth of these ensuing struggles illustrates the pains of trade liberalization within a benefitting group. After World War II, the U.S. became the global leader in trade liberalization efforts. While globalization trends emerged throughout the second half of the 20th century, the most contentious event was NAFTA in 1994. NAFTA created a trilateral trade bloc between the U.S., Mexico, and Canada, effectually pioneering agreements between high- and low-wage countries. 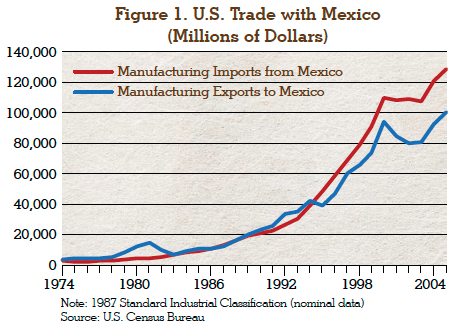 Given the U.S.-Canada Free Trade Agreement of 1989, the effects of NAFTA pertained predominantly to trade with Mexico. Prior to NAFTA, the U.S. maintained relatively low restrictions on Mexican manufacturing imports. Beginning in 1965, Mexican export assembly and processing plants along the U.S.-Mexico border benefitted from favorable U.S. duty regulations. A year before NAFTA was signed, the average U.S. tariff on imports from Mexico was 2.07 percent, while Mexico applied an average of 10 percent on U.S. exports. Two years after NAFTA, Mexico's average tariff on U.S. goods dropped to 2.9 percent and U.S. tariffs on Mexican goods fell to 0.65 percent. NAFTA's initial regulatory effect reduced Mexican import tariff and nontariff barriers, thereby benefitting Texas manufacturers. In 1994, real manufacturing exports from the U.S. to Mexico surged 14.7 percent (Figure 1) amid large increases in Texas productivity (Table 1). Exports fell in 1995 during the Mexican peso crisis but quickly recovered and kept pace with import growth for the remainder of the decade. Under NAFTA, the exchange of manufactured goods flourished between the U.S. and Mexico, but its impact on employment was less homogeneous. Mexican manufacturing competition, measured by the manufacturing import penetration ratio (Mexican manufacturing imports/U.S. output plus global manufacturing imports minus global manufacturing exports), doubled in the first seven years of NAFTA (Figure 2). Faced with growing competition, Texas manufacturers managed to add 106,800 jobs by specializing in their comparative advantage—highly skilled, capital-intensive production. Unsurprisingly, two of the U.S.'s traditionally protected labor-intensive industries, textiles and apparel, suffered the largest increases in Mexican import penetration. Before NAFTA, 65 percent of Mexican textile and apparel imports entered the U.S. duty free, and the remaining imports received an average tariff rate of 17.9 percent. The trilateral agreement phased out all duties for textile and apparel goods that met specific rules-of-origin requirements, generating massive gains in import penetration. By 2000, the apparel import penetration ratio topped the manufacturing subsectors, and the textile ratio increased six-fold, effectively erasing these domestic industries in Texas. Mexican imports also penetrated the durable goods industry, which typically requires more capital-intensive production than do nondurable goods. Three durable goods subsectors (fabricated metals, machinery, and computer and electronic product manufacturing) accounted for over three-quarters of the manufacturing employment growth between 1994 and 2000, despite significant exposure to Mexican competition. Theoretically, increased competition negatively affects employment. But it may instead create production sharing between industries in two countries by complementing each other instead of competing. The ambiguous relationship between import penetration and manufacturing jobs suggests foreign competition only partially influenced employment trends. It is possible that pre-NAFTA trade liberalization in Mexico decreased Texas manufacturing employment substantially in the 1980s, thereby diminishing NAFTA's impact. Mexico's import penetration increased 18 straight years before the agreement, accelerating in the mid-1980s during the initial trade reform. Manufacturing employment did fall 7.6 percent from 1980 to 1989 but was battered by two statewide recessions. Data on trade adjustment assistance (TAA), provided to workers displaced as a direct result of foreign trade, illustrate NAFTA's impact on Texas job displacement (Table 2). The four subsectors listed accounted for 70 percent of the certified manufacturing TAA between 1994 and 2000. As expected, the Texas apparel industry had the greatest losses, quadrupling the average petitions obtained by any other industry. In contrast, the durable goods industries, along with fabricated metal product manufacturing, led employment growth after NAFTA. Why did the successful industries, those that epitomize Texas' comparative advantage in capital-intensive production, require TAA? 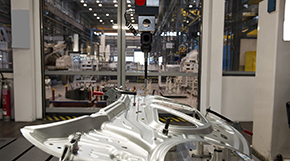 Increased cross-border integration between Texas and Mexican manufacturers generated intra-industry reallocations. On average, 40 percent of Mexican imports contain American components. NAFTA stimulated cross-border production processes, allowing the import and re-export of intermediate goods without burdensome tariffs. This flexibility allowed manufacturers to maximize efficiency by relocating upstream and downstream activities according to their comparative advantages. Even before NAFTA, 73 percent of U.S. imports from Mexico and Canada were intermediate goods (components; not fully assembled). Intermediate imports from Mexico consist primarily of durable goods, explaining the increased import penetration and TAA in these sectors, combined with employment and productivity increases. At the turn of the century, manufacturing trade flows with Mexico slowed as both economies entered national recessions. Simultaneously, China joined the WTO in December 2001, boosting its manufacturing import penetration above Mexico's (Figure 1). By 2003, China overtook Mexico as the second largest import supplier to the U.S. behind Canada. Mexico's import penetration was stunted as China consumed its market share, consequently altering NAFTA's impact on Texas manufacturing. The change negated the reallocation of labor-intensive jobs from Texas to Mexico and redirected their destination to China. 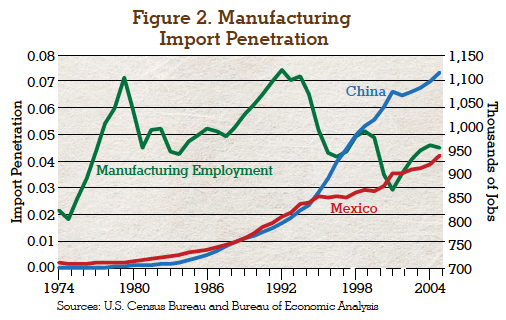 China's abundant, low-cost labor force attracted U.S. and Mexican manufacturing jobs alike. Fierce competition once again forced North American companies to improve efficiency and productivity. As a result, Texas manufacturers specialized even more in capital-intensive industries, thereby increasing their dependence on Mexican inputs. The transportation equipment sector exemplifies this advanced integration. Texas now holds a strong comparative advantage in automotive manufacturing, supported primarily by upstream activity in Mexico. Chinese trade liberalization began in the 1980s, resulting in immediate increases in manufacturing competition (Figure 2). Despite geographical barriers, Chinese import penetration nearly matched Mexico's, even after NAFTA, and ballooned after its WTO accession. 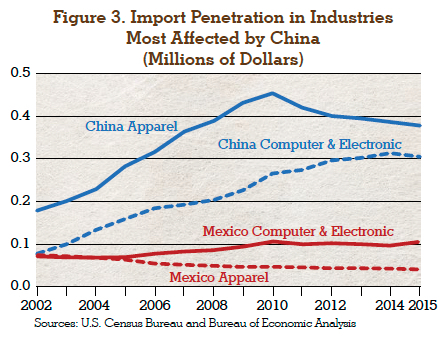 Chinese manufacturing primarily threatened Mexican producers because of their similar export baskets, namely in apparel, computers, and electronic components (Figure 3). Unlike the period of economic prosperity in the 1990s, globalization in the 2000s was entangled with two major recessions that structurally changed the economy. From 2002 to 2008, Texas manufacturing employment lost 23,100 jobs as Chinese manufacturing import penetration nearly doubled. However, the number of certified manufacturing petitions for TAA exhibited only a slight uptick, while manufacturing production expanded. China's largest impact on Texas employment occurred in the computer and electronic products sector, which thrived after NAFTA. The combination of low wages and a rapidly growing domestic market pulled computer and electronic manufacturers toward Asia. This industry lost more Texas jobs (19,700) than any manufacturing subsector between 2002 and 2008 but maintained steady production growth from increased productivity. Following the Great Recession, global economic factors tilted in Texas' favor. The companies that survived the economic downturn emerged more robust and efficient. For example, advances in horizontal drilling technology catalyzed the Texas shale oil boom, stimulating direct and tertiary manufacturing jobs. As previously stated, the transportation equipment sector continues to compete globally, partially due to its economic integration with Mexican producers. Additionally, Mexico's import penetration increased faster than the Chinese rate from 2010 to 2015, indicating further efficiency gains in the North American production process. Current economic trends in China also support manufacturing reshoring efforts. After decades of rapid growth, Chinese wages are rising and weakening China's low-cost advantage that originally attracted multinational companies. China is losing some jobs to low-wage nations, such as Bangladesh and India, while others are moving production back to North America. 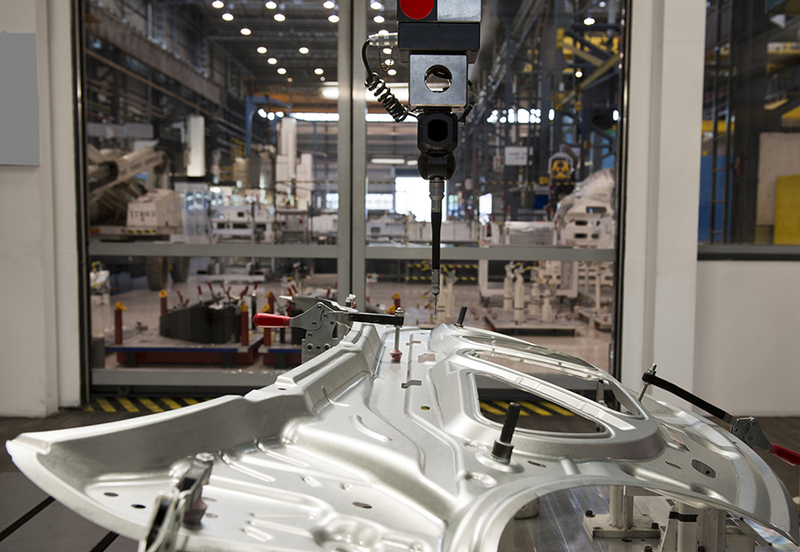 Texas competes globally for manufacturing jobs, even with developing economies. However, the employment determinant lies not with labor cost but with labor productivity. 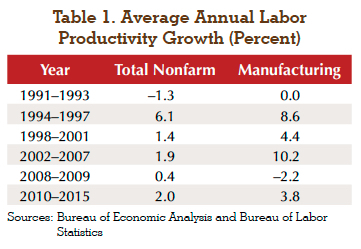 From 2010 to 2015, Texas manufacturing labor productivity averaged 3.8 percent annual growth, slower than any post-NAFTA period outside the Great Recession. To maintain its competitive advantage, Texas labor productivity must accelerate. The signing of NAFTA and China's accession to the WTO altered Texas manufacturing as expected. Both events shifted production toward industries with comparative advantages, resulting in increased productivity. Mexico's proximity to Texas creates a unique symbiotic manufacturing relationship that supports both economies' global competitiveness. Chinese competition fundamentally changed NAFTA's impact on Texas manufacturing by directly competing with Mexico for low-skill labor. As Chinese labor costs rise, other developing nations will replace that role in the global production process. Low-skill manufacturing jobs will not return to Texas, but substantial employment growth is possible behind a productive and educated workforce. Current NAFTA renegotiations present a major threat to Texas manufacturing. Texas has been a primary beneficiary of the increased economic integration with Mexico, driving the state's exports to the top of the nation. The elimination or significant altering of the agreement would shock employment and output as production processes scramble to adjust after two decades of stability. Jobs are certain to reallocate but not necessarily back to Texas or the United States. Southeast Asian cost advantages would likely attract Mexican jobs that are currently competitive under NAFTA. Decreased manufacturing competitiveness, stemming from broker or hindered cross-border linkages, could also negatively affect Texas employment. Although there is great potential to update the 23-year-old agreement, there are even larger risks associated with its demise.